Arrive in Jaipur the pink city of Rajasthan at 02:00 hrs. Receive a royal welcome with elephants and a Shehnai recitation. Jaipur is a fascinating city planned according to Vaastu Shastra by Maharaja Sawai Jai Singh II in 1728 A.D. Enjoy lunch at the famed Rambagh Palace Hotel. Visit the mesmerizing Hawa Mahal, the Jantar Mantar, Nahargarh Fort, Amber Fort and the City Palace. 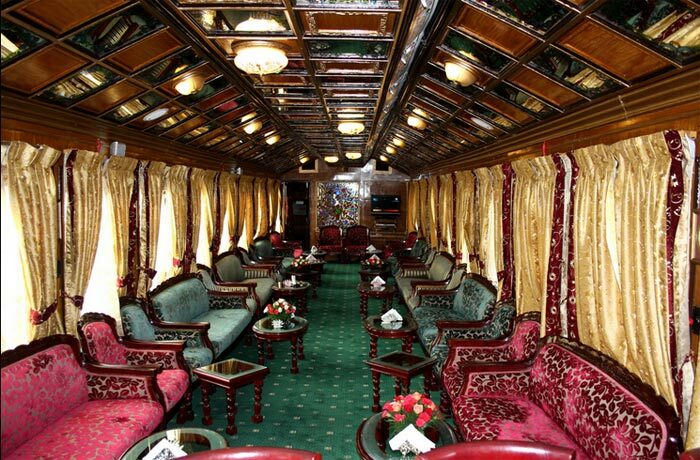 Return to Palace on Wheels at around 18:30 hrs. Dinner on board. The train departs at 19:30 for Jaisalmer. Arrive in Sawai Madhopur at 04:00 hrs. Tourists from across the globe come here to visit its renowned Ranthambore National Park tour. Famous for tigers, the park provides shelter to a variety of wildlife species. The other attraction is Ranthambore Fort. After sightseeing return to the train and head towards Chittaurgarh at 10:30 hrs. Arrive in Udaipur at 15:30 hrs., a beautiful city founded in the year 1568 by Maharana Udai Singh. Popularly known as the “city of lakes and palaces”, Tour to Udaipur is undoubtedly one of the most romantic cities of India. Visit the arresting Jag Niwas, Jag Mandir and Lake Palace. Relish your lunch at Lake Palace Heritage hotel. Post lunch, visit the enchanting City Palace. Arrive in Jaisalmer. Jaisalmer the Golden City famous for its fort and havelis, at around 08:15 hrs. It was established in 1156 by Bhatti Rajput ruler Rawal Jaisal. Visit the stunning Patwon ki haveli and Nathmalji ki haveli, the architectural masterpieces. Post lunch, enjoy camel safari in the unfathomable sand dunes. Have a good time watching the cultural programmes at a hotel in the city. Relish your dinner on the sand dunes under the moonlit sky. Return to the train. The train, at 23:00 hrs, continues its journey to the next halt, Jodhpur. Arrive in Jodhpur, a wonderful city nestled on the foothills of a sandstone hill. An oasis in the desert, Jodhpur is a fortified city with high stonewall pierced with seven gates. Visit its attractions – Mehrangarh Fort, Moti Mahal, Sheesh Mahal, Phool Mahal, Sileh Khana and Daulat Khana. Enjoy a royal lunch at the opulent Umaid Bhawan Palace. Return to the Palace on Wheels. The train leaves at 15:30 hrs for Sawai Madhopur. The train is in operation only during September to April every year. If you have not decided yet or wants to customize tour itinerary or hotels listed above in "Luxurious Palace on Wheels Train Tour Package", then we can change the travel itinerary and make a personalized, tailor-made holiday package, especially for you. We can modify this travel package as per your itinerary, budget, duration and the tourist places you would like to visit, including transportation and airfare should be included or not. Please fill the form below to contact us.